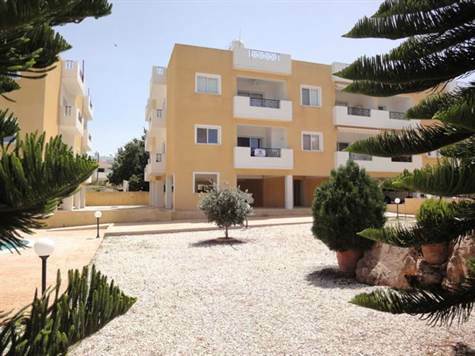 Emba, Paphos - This immaculately presented 2 bedroom apartment is situated on a small project in a quiet residential area near the traditional Cypriot village of Emba. It is within easy walking distance to the village shops and amenities and the town of Paphos is a 5 minute drive. The property features spacious living accommodation, including a lounge, dining area, and large fitted kitchen. The kitchen is well equipped with built-in oven, electric hob and extractor fan, fridge/freezer, dishwasher and washing machine. There is plenty of cupboard and worktop space. A private balcony with gorgeous views of the project’s beautifully landscaped gardens and the coast beyond can be accessed directly from both the living room and kitchen. To the side of the balcony are built-in cupboards and a useful worktop area. Off the lounge is a hallway leading to two large double bedrooms, both with fitted wardrobes. The main bedroom has an en-suite shower room and there is a good size family bathroom accessed directly from the hallway with fitted mirror, vanity unit and heated towel rail. Bedroom two has a balcony with lovely side views of the garden and pool. The project is very well maintained and has an attractive kidney shaped pool with roman steps for easy access. To the side is a wooden gazebo with tables and seating from where you can enjoy the wonderful surrounding gardens. The property is in excellent condition and has modern quality finishes. It is ideal for both permanent residence and as a holiday home. An inventory detailing the furniture included can be provided on request. There is an allocated covered parking space and near the parking is a storage room with tiled floor, electricity and fitted shelves. Please refer to MLS #:1350 when inquiring.